One of the unexpected benefits of parenthood is discovering fun events for the kids…that parents actually enjoy. Big Apple Circus has been an annual event in our family for the past seven years, one that my wife and I look forward to as much as our daughter. The circus is held every year in New York City at a tent at Damrosch Park at Lincoln Center. The venue is cozy, with only 16 rows of seats surrounding the ring and no seat more than 50 feet from ringside. This year’s theme is Luminosity, a tribute to the real world circus of New York City’s Times Square. The opening assembles the performers as members of this bustling city: construction workers, hot dog vendors, sign painters, corporate executives, surrounded by New York landmarks. For the next two hours, they transformed themselves from ordinary New Yorkers into extraordinary citizens of Gotham. The highlight of the show is construction workers Acro-Duo, (Ukrainian Vitaliy Prikhodko and Russian Alexei Anikine) performing hand-to-hand acrobatics. Alexei balances with one arm on the head of Vitaliy; in another part, Vitaliy stands straight while the Alexei is upside down in a straight body position, balancing on his partner’s shoulders. Fifteen-year-old Ty Tojo is a hot dog vendor turned juggler, rapidly keeping seven balls in the air without a miscue. According to the Big Apple Circus website, Ty holds two Guinness Book of World Records for back juggling seven balls. The Mongolian Angels (Davaasuren Altantsetseg and Narangua Altankhuyag) transform themselves from corporate executives to double trapeze artists, swinging high above the ring. It wouldn’t be New York without someone trying to swindle tourists from their money. Flimflam man Pierre Ginet was successful picking off a volunteer’s wallet and watch. Ginet also deposits a real New York City rat into a trash bin, only to be transformed into a much larger rat the size of a pig (actually a capybara, the largest rodent in the world). Daniel Cyr from France is a sign painter who uses his ladder to perform remarkable balancing tricks and ultimately a back flip off of the unsupported ladder. And what would a circus be without animals? Jenny Vidbel performs with her dancing dogs and horses. The high wire act of Duo Guerrero (Werner Guerrero and Aura Cardinali) tip-toed up to a high perch; the team jump roped while balancing on the wire and balanced standing on a chair while the chair is supported by the wire. He also walks on the tightrope with his partner on his back, much of it while she sang. In a tense moment Saturday, he stumbled a bit while jump roping on the tightwire, but quickly regained his balance. The clown, Rob Torres performs in two segments spinning plates, juggling hats, interacting with the crowd. The last act was the Dosov Troupe, specializing in acrobatics using a seesaw type instrument to launch acrobats high into the air doing multiple twisting somersaults. Carrying the danger element one step further, one acrobat does back flips on stilts. This is a fast paced two hours of entertainment, with 18 segments and never a dull moment. 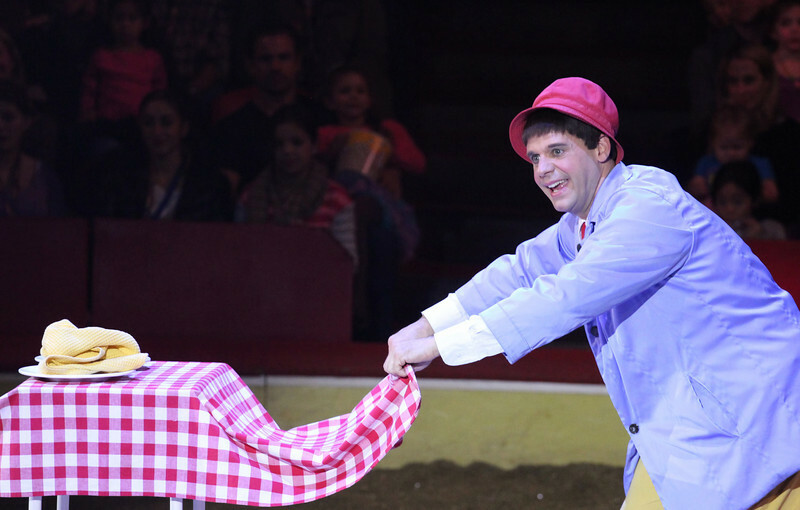 The Big Apple Circus was founded in 1974 and is a not-for-profit performing arts institution. The troupe performs at Lincoln Center until January 12, then on to Alpharetta, Georgia from January 30-February 17, Bridgewater, NJ from February 27-March 16, Boston from March 25-May 11, and Queens from May 18-June 15. The Big Apple Circus is photography friendly, allowing photos but no flash or video. I used a Canon T2i with a 70-200mm f4L non-IS zoom. The T2i is a mid-level somewhat compact DSLR designed and priced for consumers rather than professionals. I sat on the side of the ring and the lighting conditions were challenging due to the darkness and contrasting light. Most of the photos were at 3200 ISO with a shutter speed between 1/250-1/320. With 3200 ISO, the photos were a bit grainy, so I used Topaz de-noise software. Overall, shots of slowly moving objects turned out fine. However, shots of fast moving acrobats doing somersaults were blurry and generally out of focus. I would think that a more responsive sports camera would shine in the dim light with fast moving objects, with higher ISO and greater autofocus capabilities. I guess that’s why a professional camera like the Canon EOS 1 DX costs $6,800 (body only) and a 70-200 f2.8L IS retails for $2,500 over my equipment (about $600 for the T2i and $700 for the 700-200 f4L).